Vladimir Putin shakes hands with Francois Hollande during a meeting at the Kremlin in Moscow, Nov. 26, 2015. Russian President Vladimir Putin and his French counterpart Francois Hollande have held talks in Moscow, discussing the possibility of creating a broad coalition to combat terrorism in Syria. An agreement on a broad coalition was impossible to achieve, but one Russian official has hailed the talks as a breakthrough. Francois Hollande’s visit to Moscow for talks with Russian President Vladimir Putin on Nov. 26 marked the end of a diplomatic tour that the French leader began shortly after militants from Islamic State (ISIS) carried out terrorist attacks in Paris on Nov. 13. Prior to his meeting with Hollande, Putin discussed the need to intensify the fight against ISIS with the leaders of the U.S., Britain, Germany, and Italy. Following the meeting between the French and Russian presidents, which lasted several hours, as expected, it turned out that a single, broad coalition to combat ISIS, which would include the United States and Russia, was not on the table. At a press conference after talks in the Kremlin, Putin said that Russia’s “partners” –a coalition of several dozen countries acting against ISIS in the Middle East, led by the U.S. – are not yet ready for this kind of initiative. There was also no agreement on another key issue underlying the general problem in forming a coalition – the fate of Syrian President Bashar al-Assad. Hollande said that there is no place for Assad in the future of Syria, while Putin stressed that the fate of the Syrian president is in the hands of the people of Syria. At the same time, despite the differences, the meeting has already been hailed as a “breakthrough” by Head of the State Duma Foreign Affairs Committee Alexei Pushkov, who used the term to describe the agreement reached between Russia and France on joint actions in Syria against ISIS. At the meeting, the presidents agreed, according to Hollande, “to intensify exchange of intelligence information and focus our attacks on ISIS and terrorist groups.” As Putin said, it is necessary to avoid attacking areas where there are formations present that are ready to fight against terrorists. Pushkov, speaking on the Russia-24 TV channel, interpreted this agreement as “two great powers of the modern world, two members of the UN Security Council, starting a common, and not separate, fight against the terrorist organization Islamic State.” This avoidance of using “hints and statements” in favor of “specific arrangements” the Russian parliamentarian considers a breakthrough. Experts are more cautious here, although they do note the importance of the outcome of this meeting. Arrangements for coordination of operations against ISIS between France and Russia – “are a big deal,” according to Dmitry Danilov, head of the Department for European Security at the Russian Academy of Sciences’ Institute of Europe. The agreement between Paris and Moscow shows the path to other participants in the battle against ISIS – “that path, which one can follow, by developing cooperation with Russia,” said Danilov. In the context of it being impossible to form a broad coalition on this project, this could become an alternative form of cooperation between countries in the fight against terrorism. In this case, the arrangements made between Hollande and Putin to coordinate their anti-terrorism efforts could become a kind of model for other states that are also part of the American coalition. According to Yevgeny Minchenko, director of the International Institute for Political Expertise, the mere fact that active negotiations on joint actions in Syria have started is already important. Previously, he recalled, the U.S. and its allies actively criticized Moscow’s Syrian policy. Now the West is beginning to move away from these positions. 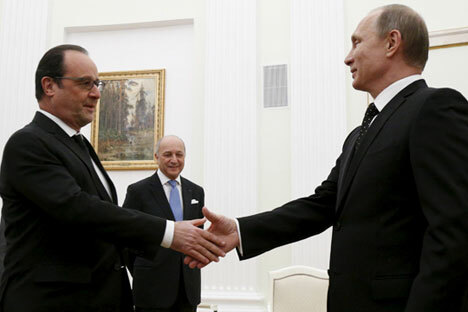 Hollande’s visit to Moscow may also play a positive role in Russia’s relations with the Euro-Atlantic community. In Danilov’s view, France could act as a kind of a “balance beam.” In the light of its new relations with Moscow on the Syrian conflict, Paris can exercise influence on the positions of other members of NATO and the EU, he said. These others, albeit indirectly, have now become involved in the conflict between Russia and Turkey, because of the Nov. 24 downing of the Russian Su-24 bomber near the Syrian-Turkish border by the Turkish air force. In this context, argued Danilov, France can play a positive, calming role.